foxteachingstudio: Recital 2018 A huge success! Recital 2018 A huge success! Congrats to our performers, our families and friends, and Mary Lou Holt for a great evening! Thank you to Bearden Methodist and Lunsfords Music for their support. I am a member of the Symphony of the Mountains in Kingsport, TN and the Southwest Michigan Symphony in Benton Harbor, St. Joseph, and Berring Springs, MI and many other performing organizations throughout the United States. 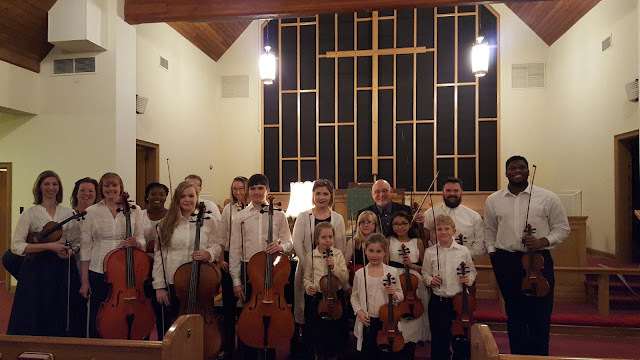 Formerly a member of the Knoxville Symphony, Oak Ridge Symphony, and Assisi Performing Arts in Italy, I teach as the String Faculty at Lunsford's Musical Instruments Inc. 3606 Western Ave. Knoxville, TN 37921. I taught at Walters State Community College from 2012-2016. I freelance in churches in the Southeast United States. Mission Statement: To provide world-class instruction as a teacher for lessons in violin and viola. I draw my experience on completing my Bachelors, Masters degrees, and post-graduate work in Applied Music, as a teacher of pre-college and college students, and as a professional performer with years of full-time experience in the United States and Europe. Students are welcome regardless of age, gender, race, ability, nationality, and creed. This lesson studio is a care-giving and inclusive partnership between student, teacher, and parent. We work as a team with area string programs, arts organizations, and the symphony. Lessons are motivating and inspiring. 1) Please call me at home for lesson scheduling issues. You are welcome to call and e-mail for information and discussion. You may call me early or late at home. Messages left to the students and parents about schedule changes must be returned promptly by the students and parents. Please pay me for the month at the first lesson of the month during the first week of the month. If you are not at the first lesson of the month, please make arrangements to pay me during the first week of the month. Thank you very much! 2) Thank you for accommodating my symphony and related conflicts. Those appointments will be rescheduled and made-up. Please give 24 hours notice to move a time slot for a make-up. Students who have canceled outside of these times forfeit their appointment. The decision to make up a slot is always at my discretion. No credits on the monthly fees will be given: for deciding not to make up a time or a cancellation in particular. If you miss a lesson, you pay for the lesson. If payment is more than two days late from the original time for the first lesson of the month whether the student is or is not at that lesson, then a $15.00 late fee is applied to the monthly total. Previous incentives for a discount for paying early are eliminated. 3) During the summer months, lessons continue with the exception of both parties being out-of-town. Lessons will be rescheduled as normal. During the season(August-May), rescheduling is the norm. 4)Bad Weather Policy: Two conditions: bad roads determined by 1:00PM the day of the lesson and schools closed. Lessons would be rescheduled for safety. 5)You pay one fee each month. This includes all lessons, group classes, clinics, and social events. For the annual recital, each student pays the pianist at the first rehearsal and the event is required. Attendance at the special rehearsals is mandatory. 6)Usually, I cannot teach during Saturday afternoons. I play weddings. 7) Due to KSO overtime and traffic, please wait 20 minutes past the start time of the lesson for me to arrive. All time under these circumstances will be made-up. 8) I will be happy to advise my students and parents regarding renting or purchasing equipment and supplies. At no time, I do I receive a commission from any business. Please consult with me in general about the care and shape of your equipment. 9) Practicing is expected but will be fostered and cultivated. All students have ups and downs with this. 10) Please notify me regarding all playing outside of the studio. This is for your protection and benefit. Please provide all audition information in its original form to me and allow enough time to prepare an audition or performance. 11)I am happy if students wish to play non-classical music such as folk, fiddle, Scottish, gospel, jazz, or whatever. Please use standard and classically carved bridges on instruments. We always wish to motivate! 12) Most students and parents are sincere and conscientious. We need to communicate our appreciation for that. Sometimes, we have situations that are not: these will need to be resolved accordingly. In extreme cases, termination of the lessons can occur. 13) Music theory, aural theory, and music history are available as part of the lessons. Please attend concerts and listen to music. We always wish to have fun making music. There is no greater activity in life than that!! We take as much as possible a relaxed approach to performing. 14) All students need to bring all outside the lesson music such as orchestra, church, and recreational music they are performing to each lesson each week. 15) Children under the age of 16 must have a parent in the building or parking lot during their lesson. In case of an emergency, the child is not left alone. 16) I would prefer a two way conversation on the phone for scheduling issues since both the families and my schedule are complicated. This will save time. Please do not email or text schedule changes. I drive a great deal during the day and is not safe to read while driving. Thank you. Phone messages MUST be returned promptly. Thank you! We have planted good seeds in this studio since August 1999 and I think we will continue to grow. We always strive to respect each other, motivate and inspire, and nurture when necessary. To make music, we need to go deeply into ourselves and this is a learning process for us all. Please remember that I too am a player. We all share the same issues, frustrations, and joys when playing our instrument! We always wish to have a very positive environment for lessons!!!! !